The game is played over several rounds. In each round, each player chooses one of seven different roles and, thereby, offers all players, in clockwise order, the action associated with that role. For example: with the settler, players can place new plantations, on which, with the help of the craftsman, players can produce goods. 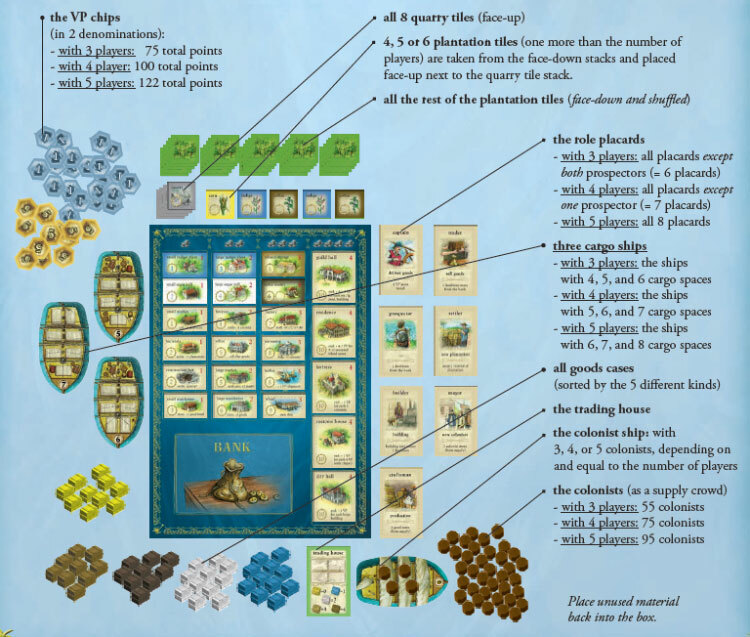 Players can then sell these goods to the trading house with the trader or, with the captain, ship them to the old world. With the money earned from such sales, the players. with the builder, may build buildings in the city, and so on. The player who best manages the changing roles with their associated actions and special privileges, will achieve the greatest prosperity and the highest respect and, thereby, win the game. The winner is the player who earns the most victory points. Place the game board in the middle of the table. Place all the buildings on their assigned spaces on the game board (see below). 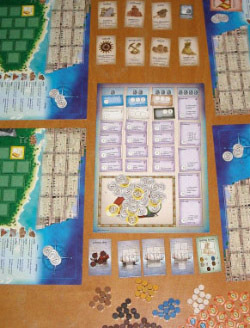 Sort the doubloons by value and place them on the bank on the game board (see below). 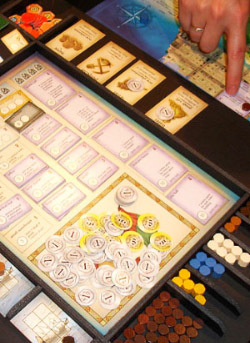 The players store their doubloons on the windrose on their player boards, so that all players can see how much money each player has. The game is played over several rounds (about 15). Each round is played in the same way. The player with the governor card begins. He takes one of the role cards, places it face-up next to his player board, and takes the action allowed by the role card. Then, his left neighbor takes the action allowed by that role card, and so on around the table, in clockwise order, until every player has taken this action once. Next, the left neighbor of the governor takes his turn: he takes one of the remaining role cards, places it face-up next to his player board, and takes the action allowed by the role card. Then, his left neighbor takes the action allowed by that role card, and so on around the table, in clockwise order, until every player has taken this action once. Then, his left neighbor takes a role card, and so on until all players have taken a role card and all players taken the actions allowed by the role cards taken. Next, place one doubloon on each of the three role cards that were not taken by a player during the round. Then, place the used role cards back on the table next to the unused cards. The left neighbor of the player with the governor card takes the governor card, becoming the governor for the next round. He begins the round and the game continues as before. Each role grants the player who takes the card a special privilege, and also, a specific action that can be taken by each player, in clockwise order, starting with the player who took the role (exception: prospector). If a card has one or more doubloons on it, the player who takes the card gets the doubloons in addition to the privilege and action associated with the card. The action associated with a role card is always taken first by the player who took the card, followed by the others in clockwise order. A player must always take a role card when it is his turn to do so, but he may choose not to use the action or privilege of the card he choses. The other players, of course, get their turns at the action of the card. The action of a role card is optional (exception: captain). A player may choose not to or be unable to use the action on his turn. A role card remains in front of the player who took it until the end of the round. It may not be taken by another player in the round. More information about all the roles. Each cargo ship will carry goods of only one kind. Players may not load goods on a cargo ship if goods of that same kind are on one of the other two cargo ships. Players may not load goods on a full ship. On a player's turn, he must load goods if he can. However, he may only load one kind of goods. When a player loads goods of a kind, he must load as many of that kind as he can. A player cannot hold back goods when there is space on a ship carrying the kind of goods he has. If a player has a kind of goods that can be loaded on several empty ships, he must choose the ship where he can load the most goods, leaving none behind, if possible. If a player has several kinds of goods that he can load, he may choose freely, which goods to load. He need not choose the goods that would allow him to load the most barrels. For each good (each barrel, not each kind of good) a player loads, he earns one victory point (1 VP) in the form of value 1 victory point chips. When loading goods onto the cargo ships, all kinds of goods have the same value: 1 VP per barrel loaded! The goods values used in the trader phase are not used here. When loading his first kind of goods, the captain takes as his privilege one extra victory point. He does not get extra VPs for each kind he loads. A player keeps his victory points, unlike his money and goods, secret from the others. A player puts his victory point chips face-down on his windrose. From time to time, players should convert 5 value 1 chips for a single value 5 chip. When no more goods can be loaded on the cargo ships, the players must store the goods left on their windroses. Each player may store one good (one barrel) on his windrose. For all other remaining goods, each player must find room in one of his warehouses (small or large). If a player does not have sufficient warehouse space, he must place all extra goods back in the goods supplies (see more information under "small warehouse"). As his last duty, the captain unloads all full ships by placing those goods back in their separate supply piles. Partially full and empty ships remain as they are until the next captain phase. It will be more difficult to load goods in the next captain phase, because of the kinds of goods already on the cargo ships and the fewer number of spaces available. Notes: Remember the special functions of the small and large warehouses, the harbor, and the wharf. If a player cannot store all his extra goods, he may choose which goods to store and which to return to the goods supply. The captain earns only one extra VP as his privilege, regardless of how many kinds of goods he loads. If he loads no goods, he does not get the extra privilege VP. Players only check for goods storage at the end of the captain phase. Players store goods acquired in other phases on the windroses without limit until the next captain phase. 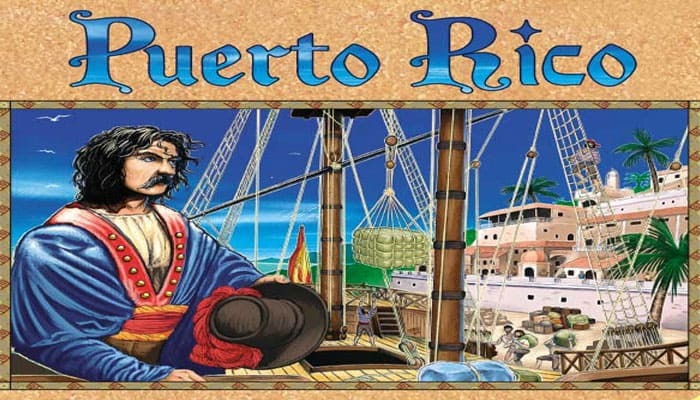 The player who chooses this role initiates no action, but receives as his privilege 1 doubloon from the bank. After the last player in the round takes a role and all players complete the action, if any, of the role, the round ends. Now, the governor takes three doubloons from the bank, placing one each on the three role cards that were not selected during the round. The doubloons are placed regardless of the number of doubloons already on the cards. Role cards with more doubloons will be more attractive to the players as they get the doubloons in addition to the privilege of the card. For example, a player choosing a prospector card with 2 doubloons will get, in total, 3 doubloons for his effort. Finally, the players return the role cards they selected to the area next to the game board and the governor gives the governor card to his left neighbor. The new governor begins the next round by selecting a role card, and so the game continues. during the captain phase, the last of the victory point chips is used. When the victory point chips are exhausted, players earning victory points thereafter should track them with pencil and paper. the value of his VP chips (including those noted on pencil and paper). the VP value of his buildings (red-brown number in upper left). the extra VPs of his occupied large buildings. Note: a building scores its victory points even when it is not occupied. Thus, for example, the five large buildings score 4 VP each when they are not occupied. The five large buildings score the extra victory points only when they are occupied! The player with the most victory points is the winner! 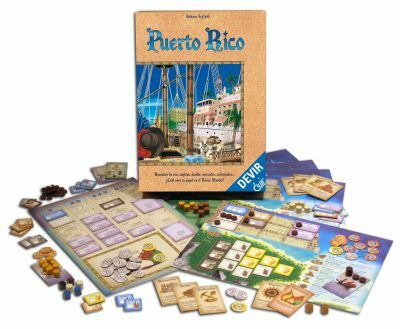 If two or more players tie with the most VPs, the player with the most doubloons and goods together (1 good = 1 doubloon) is the winner.